BECKHOFF Automation presents the new CX9020 embedded PCs that offers compact PC control for a wider range of applications. Equipped with a powerful 1 GHz ARM Cortex A8 processor, the fanless CX9020 embedded PCs are suitable for a wide range of PLC and motion control applications in small- and medium-sized machines, systems or buildings. The multi-interface can be configured ex-factory, if required, offering scope for numerous optional extensions from an audio interface up to the connection of fieldbus masters or slaves. 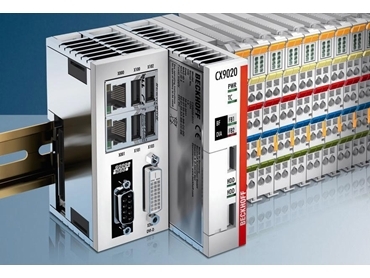 The multi-optional interface of the CX9020 enables integration with all common fieldbuses and industrial Ethernet systems including EtherCAT (slave only), PROFINET, Ethernet/IP, PROFIBUS, CANopen and DeviceNet serial interface (RS232/RS422/RS485) or audio. The extended operating temperature range of -25ºC to +60ºC enables application in demanding environments including a wide range of manufacturing facilities as well as outdoor applications such as wind turbines and solar power plants.